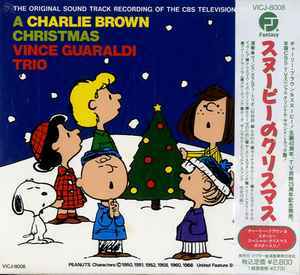 Japanese (Victor Music Industries [VMI]) 1990 release of Fantasy records A Charlie Brown Christmas, entitled スヌーピーのクリスマス (Sunuupii no Kurisumasu). Has an obi and blue cardboard slip case. Inside is a poster, variation of the slipcover. Seems to be based on 1988 Fantasy version re-release with 12 tracks, including Greensleeves.